We participate in multiple networks to provide you with nationwide access to branches, service centers and surcharge-free ATMs so that you are never far from your money. 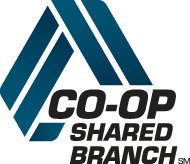 We share branch offices nationwide with other credit unions in over 5,000 locations. You can perform a variety of day-to-day account transactions at these locations just as if you were at an EPFCU branch. We also participate in nationwide network of 80,000 surcharge-free Allpoint and CU Here ATMs. Hours: Mon.–Fri., 9:00 a.m.–3:30 p.m.
Closed from 1:00 p.m.–1:30 p.m. for lunch. *Limited 15-minute parking with flashers on at curb; metered spaces also available. In the event Catholic University is closed, our branch office will be closed. Tues., 8:00 a.m.–3:30 p.m. except on pay week then 6:30 a.m–3:30 p.m.